I had a heart attack Tuesday morning. Well, my medical records report it as ACS, acute coronary syndrome. Fortunately for me it was caught early enough so that there was no permanent damage to my heart. However, the artery was closed enough to warrant inserting a stent to increase the flow of blood to the heart muscle. It is not the heart attack I want to tell you about. You need to know about that so I can tell you about the strange part. Before Dr. Ware could insert the stent he needed to give me a sedative. The nurses wheeled me into the operating room, inserted a catheter in a vein in my right hand and prepared to infuse the sedative. The nurse inserted the needle in the catheter and just as she pushed the plunger I jerked my hand back and said no. I climbed off the gurney and walked out of the operating room. Dr. Ware and his assistants just watched me walk out without attempting to stop me. I walked right through the waiting room past my wife and daughter and a couple of friends who were there for moral support. They never looked up. I made it to my room and found my clothes. The shirt I had worn to the hospital Tuesday morning was still in the little metal locker with my trousers and shoes. Funny I had not noticed that the bottom button on the shirt was broken when I wore it on Tuesday. My wallet and keys were not with my clothes and I assumed Sylvia was holding on to those items for me. At any moment I expected to hear an alarm or hear people coming to stop me but I walked out of the hospital without incident. Matter of fact, I walked all the way home and never saw a familiar face. For five hours and eleven miles I walked expecting any moment to see someone come along side me to carry me back to the hospital. Finally I made it to my front yard. Just as I stepped onto my grass I saw my daddy pull up in his blue pickup truck. He parked on the side of the grass and left the engine running. He never gestured or spoke to me until I walked over to the truck. I leaned in the passenger side window and Daddy said “Hey Arby!” and gave me a nice grin. I still don’t know why he called me Arby or where the name came from. “Hey Pop”, I answered. I waited for him to tell me why he was at my house. He rarely came to my house and never unless Mother was with him. I opened the door and sat down beside him and still he remained silent. He looked over at me and put the truck in gear. As we drove down the road I told him a couple of new jokes I had heard recently. It was nice to listen to him chuckle and watch his face as it broke into a grin. Still he did not talk. Presently I heard him singing softly and off key “Do Lord, oh Do Lord, Oh Do Remember Me”. He never got beyond the first two lines of the song and sang them over and over again. We drove around for what seemed like hours. Finally he turned into a neighborhood that was both familiar and unfamiliar at the same time. I thought I could recognize the general area but I could not positively identify any of the streets and houses. After a few turns and stops Pop slowed down in front of a neat brick house on a corner lot. The yard was small but neatly kept. Pop stopped singing and looked at the house on the corner lot. I waited for him to say something. He eased the pickup around the corner and stopped under a large hickory tree. The green nuts fell on the roof of the pickup. I looked at Pop as he watched the house and his eyes were red rimmed and filled with tears. I turned to see what he was looking at. The house had several large windows and was well lighted. There were several people inside the house and as I watched I could have sworn that my mother came to the window. She smiled as she saw me in the pickup with my daddy. She did not wave or make any gesture toward me. I have always thought that my mother was the most beautiful woman in the world. Today I saw her in a light that amplified her beauty. I am afraid I am not articulate enough to describe the beauty that flowed around her. Strange, I thought, Mother has been dead for 8 years. Pop looked at me as tears streamed from his eyes. “You can go in there,” he said, “but I am not allowed. This is as far as I can go.” Then he pulled away in the pickup and drove on down the street. This is indeed strange, I thought again. Daddy has been dead for 12 years. “Well.” I thought, “I will just go in and see Mother. I bet she has cooked something good to eat”. Editors Note: This first person account was submitted to the Star-Courier as an exclusive contribution by a doctor in Georgia. However, he has asked not to have his name published. CROSBY  A packed school board meeting last Monday was a mix of expression of gratitude and concern. The CISD School board heard from citizens concerns, reviewed the budgets, approved Bond Proceeds invoices for over $3 M., approved a resolution authorizing a loan at Crosby State Bank for operational expenses if necessary, discussed TAKS Scores, passed a change to the Drew Intermediate starting time and went into session to talk about hiring a new coach. The official report from the local school board here will announce the new Athletic Director on Friday, June 25 from the list of four candidates but sources outside the district indicate that Alan Weddell is the top candidate for the position. Alan Weddell is one of the most successful head coaches in Texas high school football history. He lead La Margue to three consecutive Class 4A state championships, compiling a 103 13 record while winning six district crowns. During the meeting the board approved $15,000 for new band instruments that had not been requested by the former Band Director. Initially, the board room was packed with Crosby Band Boosters, youth league coaches and as well as the usual suspects to hear the action of the board. A Proclamation of the actions of Pam Johnson and her aids in producing Project Graduation through massive effort started the meeting on a positive note that would sour as the song played. Chris Claunch endorsed Eisenhower Principal and former Crosby Defensive Football Coach Joe Berezoski as enabled to diversify athletic emphasis. Claunch expressed concern that the rumored coach might have other problems and that a winning history in football should not be a sole criteria for hiring. Other speakers on the topic expressed concern that the previous coaches had not put adequate emphasis on girls sports and critiqued the stripping of other sports programs including soccer. The Crosby Soccer teams included a Bi-District championship by the girls and the boys finished in fourth place. The application deadline is Thursday night for the hiring of the new Athletic Director position. The post became vacant when Larry Haynes resigned to travel to Aldine Eisenhower. La Marque was the team that truncated Crosbys play-off effort, 6914 under Haynes after a 8-4 season. Crosby has had a labile recent history in football. In 2000 the Cougars went to the Astro Dome to be defeated by La Marque. In 2001 Jimmy Dickie resigned after a 19 season. The reporters in 2002 saw the Cougars go 6-4. Weddell has an opposite approach to offense as has been employed by the Cougars under Haynes. As Kellen Haynes (son of the former head coach) and Phillip Beck have graduated, the air war may become something of the past. Weddell stresses a strong running game with multiple attack modes. Weddell was Texas A&M Universitys linebackerss coach from 1998 through the end of 2002 and certainly knows defensive strategy. Superintendant Don Hendrix had expressed that there was no discussion of changing from a Millitary Marching Band program and now the school is seeking applicants for the new position. 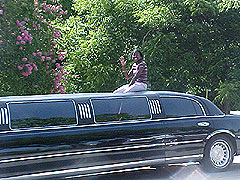 Miss Juneteenth 2004 Taclesha Blanchard waves to the crowds from atop a limo during the McNair Juneteenth Parade held Saturday. The parade was part of a week-long celebration hosted by the Atomic Lodge #327. The parade also featured entries from local businesses, Harris County and the McNair Volunteer Fire Department. The San Jacinto Monument highlights this float representing Harris County Precinct 2, which rode in the McNair Juneteenth Parade held Saturday. The parade was part of a week-long celebration hosted by the Atomic Lodge #327. The parade also featured entries from local businesses, Miss Juneteenth and the McNair Volunteer Fire Department. HUFFMAN Middle and high school students in Huffman ISD, who participate in extracurricular activities, may have to pass a drug test to stay active. This week, the Huffman school board approved a policy of random drug testing for students in grades seven through 12 who participate in extracurricular activities, or who drive district vehicles. Under the policy, students involved in activities such as athletics, cheerleading, UIL academic contests, band, dance team and FFA would be placed in a pool where names would be drawn at random through the year for testing. Steve Myers, district superintendent, said that they expect to test between 40 and 80 students a month. The district estimates about 800 names would go into the pool. Over the course of the year, roughly half of these students will likely be tested, although since the names are drawn randomly it is possible a student may be tested more than once a year. Rather than test all eligible students initially, Myers said they will begin the random testing pools at the beginning of the fall semester. Currently, the district uses Pinnacle Testing for its employee testing. While they will not be required to use the same company for students, Myers said they are discussing the policy with the company. While they dont have the exact costs confirmed, Myers said that he has asked for $15,000 in the budget for the testing. Barbers Hill ISD, which has used random testing since 2002 and has approximately the same number of students as Huffman, spent $15,725 last year. This works out to $18.50 per test. Proponents of testing say that the policy is not aimed at catching students who use drugs or alcohol but serves as a tool to help students just say no. Opponents have questioned the legality of testing saying it violated Constitutional protection against unreasonable search and seizure. However, in 2002 the U.S. Supreme Court ruled that compelling students to submit to the tests did not violate Constitutional protection. This Court further stipulated that this decision only applies to students involved in extracurricular activities or those who submit voluntarily. The district cannot legally compel all students to submit to random drug testing. NORTHEAST HARRIS COUNTY  Unincorporated areas of Harris County have new help on the way to deal with locations known for excessive wrecks, speeding and drivers with unusual habits. Two Northeast Harris County fatal accidents last week, two the previous week and numerous accidents on FM 2100 (including two for the last three weeks in front of Crosby High School) preceded the decision. Captain Michael OBrien, head of the District III Wallisville Substations Patrol Division, has launched a new initiative to enable more public safety on local roadways. OBrien has assigned Deputy G. Golden a traffic enforcement task targeted at addressing traffic complaints made by citizens in the district. Sometimes the visibilities of law enforcement at the said locations are a deterrent. explained OBrien. An accident on the 12,900 block of Beaumont Highway on June 16 at about 8:56 a.m. took the life of Carolyn Sue West, 50, when a bobtail truck trying to apply breaks in the rain, spun counterclock wise and into the westbound lane of traffic. It could have been any resident using Beaumont Highway that was victim to the high volume of truck traffic on that highway at rush hour. Harris County Sheriffs Traffic Division reports indicate that on June 15, at about 10:00 p.m. in the 9700 block of Pineland, two pedestrians were struck by a 1995 Thunderbird as they crossed the street. Romero Clemuel Alexander was charged with manslaughter in the death of Jose Manuel Cardona, 20, when investigation revealed that Alexander had been driving on the wrong side of the road. Golden indicated that citizens response to the initiative has been positive and is being implemented throughout the district. 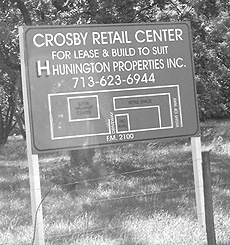 CROSBY  Main Street here is about to undergo new commercial and residential developments North and West of the Wal-Mart Supercenter  across the street from the strip center featuring a Walgreens. The developers acquired 5.25 acres with the Pecan Orchard and are planning to develop 500 feet in from FM 2100 as a retail shopping center. Ground breaking is scheduled in two weeks. The coming 20,000 square foot retail center is expecting to take 4 to 5 months to build tenants but construction is expected to begin in 60 to 90 days. The company expects to open stores the first quarter of next year. We are optimistic enough to believe we are going to add to the commercial success in the Crosby area through retail and medical tenant institutions. We are balancing the tenants needs through proper aesthetically appealing architecture. said Aron adding that they are currently awaiting a permit. Huntington Properties has 30 year experience developing retail centers at front door master plan communities. Other sources indicate that a residential developer is in play to acquire a nearby tract of land that is to be partially residential and partially a grass farm just behind the shopping center. The other source indicated that interest has been generated and architectural plans devised to put a dialysis center in the shopping center. HOUSTON — Deliberations continued this week in a civil lawsuit brought by a Crosby woman against diet supplement giant Metabolife International. According to court documents, Rhea McAllister said that in April 2002 she suffered a stroke a month after she began taking Metabolife 356. McAllister, who was 33 at the time, said that Metabolife International knowingly sold a dangerous product whose main ingredient, ephedra, has been named as a cause of heart attacks, stroke and seizures. McAllister’s attorney, Edward Blizzard, said that the stroke symptoms occurred over several days that that his client still suffers adverse affects from the incident. According to the National Center for Complementary and Alternative Medicine, “the principal ingredient ephedrine is an amphetamine-like compound that can powerfully stimulate the nervous system and heart.” Ephedra is also used in Chinese medicine under the name Ma huang. Attornies for Metabolife International said that they never received any complaints that their supplement was dangerous. The FDA disagrees. They said that Metabolife failed to report some 13,000 complaints dealing with health conditions. When Congress held hearings on Metabolife and ephedra, the supplement’s creator Michael Ellis refused to testify claiming Fifth Amendment protection. The website “classaction america.com” claims that the FDA has gotten reports of over 100 deaths which resulted from ephedra-base supplement use. Ellis is a former police officer and San Diego businessman who was arrested in 1992 in connection with a methamphetamine lab near his Rancho Santa Fe estate. During the raid, police seized enough chemical supplies to make 500 pounds of methamphetamine. Ephedra is a main component in the drug. After pleading guilty to using a telephone to facilitate a drug deal, Ellis was given five years probation. The same year he launched the ephedra-based herbal supplement Fosslip. Commercially unsuccessful, he reformulated the supplement and released it in 1995 as Metabolife356. On April 12, the FDA published a final ruling that banned the sale of dietary supplements containing ephedrine alkaloids, like those in Metabolife. Following the ruling, the company pulled their product and released a non-ephedra version. This is not the first time that Metabolife International has been sued over their product. 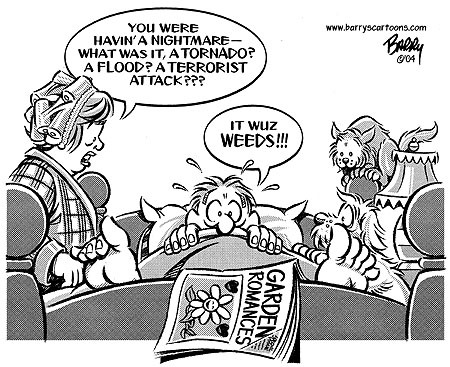 In 2002, Connie Thornburg of Fayetteville, Al. was awarded a $4.6 million judgment. This was the first successful case against the company. The judgment is under appeal. Court watchers say that they expect the McAllister case to wrap up by the end of the week.